There are many teaching methods with different means and aids. Correcting mistakes is one that educationalists call the 'remedial method'. Correcting people's mistakes is essential if teaching people is the aim. Correcting mistakes is a divine method the Prophet (blessings and peace be upon him) practiced, as some verses of the Qur'an were revealed to correct certain mistakes made by his eminent Companions. 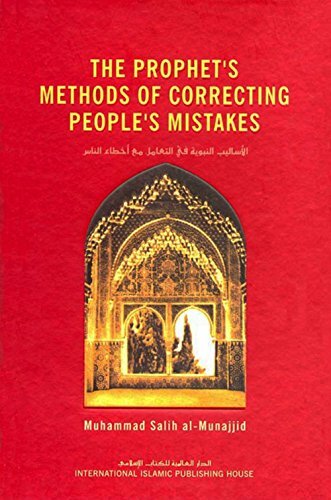 The Prophet (peace be upon him) was divinely guided in correcting people's mistakes, so his methods are the best of all. Following the example of the Prophet (peace be upon him) is therefore the best approach if one is really keen to teach Islamic knowledge and any of the other branches of knowledge. Shaykh Muhammad Sâlih al-Munajjid describes with clear examples from the Sunnah the various methods of the Prophet for teaching people and correcting their mistakes. This book is indispensable for everyone concerned with education in general and Islamic knowledge in particular. It is an excellent reference in educational methodology.